As Executive Vice President and Southeast/Central Region Market President, Brian Wheelan is responsible for leading and driving Beacon’s business in the Southeast/Central Regional market. Leveraging his high-performing team, Brian works to deepen existing client relationships, grow the company’s footprint, ensure we will meet our programmatic and operational commitments, deliver the bottom line, and live our mission. Brian formerly served as Beacon’s Executive Vice President and Chief Strategy Officer where he led the company’s sales, marketing, development, partnering and acquisition activities. His previous roles at Beacon Health Strategies include Executive Vice President of Corporate Development and Strategy, and Chief Financial Officer. 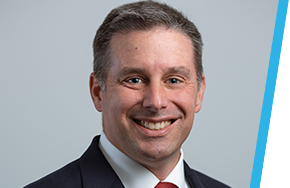 Before joining Beacon, Brian was a Manager at Bain and Company where he specialized in corporate strategy development and mergers and acquisitions for hospital systems, long-term care systems and large payers. Prior to Bain, he served as Assistant Secretary for Policy and Planning and the deputy director of Medicaid for the Executive Office of Health and Human Services of the Commonwealth of Massachusetts. Brian received a Master of Business Administration from Harvard Business School and a Bachelor of Arts from Dartmouth College.